The Birds Eye difference is our quality commitment to you. Delicious food, made from the best quality ingredients. Happy families guaranteed. Here at Birds Eye we know how to make the perfect chicken dipper making those teatimes stress free with all the quality we know you expect from us. 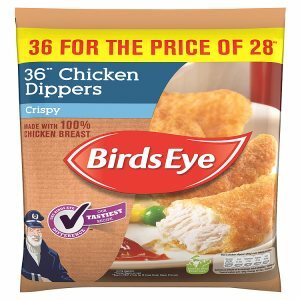 100% chicken breast responsibly sourced from carefully selected farms, the majority of which are family owned We only use the finest quality ingredients which you would find at home Why does it say made with 100% chicken breast if it's 50% chicken breast? Made with 100% chicken breast means we use only chicken breast meat in our range. The other 50% relates to the other tasty ingredients such as the coating. Cooking Instructions General Your Chicken Dippers contain raw meat, please ensure that they are cooked thoroughly until piping hot throughout. Tastiest when Oven Baked Straight from the Freezer. Please ensure food is cooked until piping hot. These instructions are guidelines only. Do not refreeze after defrosting. Oven cook From Frozen Alternatively, grill. 210°C, Fan 190°C, Gas Mark 7 15 mins Pre-heat oven. Place on a baking tray. Cook until crisp and golden. Grill From Frozen Medium Grill 12 mins Pre-heat grill. Turn over occasionally. Cook until crisp and golden.